Bana Talk Of A Hitler: A ‘Nazi Nirvana’ In 2020? The two quotes – one from Hitler’s ‘Mein Kampf’ and the other from Buddhagosha’s ‘Visuddhimagga’ – path to purification demonstrate the dissonance of the ‘dhamma’ emanating from the Monastic order which holds hostage what is perceived as Sinhala Buddhist consciousness. A doctrine that was in its essence, a timeless message of ethical perfection has been reduced to a religio-nationalist ideology. The Anunayaka of the Asgiriya Chapter Ven. 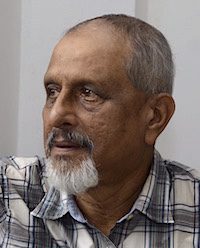 Vendaruwe Upali thero has told us not to politicise or misinterpret his references to the words ‘Hitler’ and ‘military’ used in his 30-minute long ‘Anushasanwa’. He has advised us to consider it in the correct context. The objective of this exercise is to place his references to ‘Hitler’ and ‘Military’ in the correct and appropriate context. Obviously, it must be the Sinhala Buddhist context. The devotee and direct recipient of the advice and ‘Anushasana’ of the venerable Anunayaka thero has also weighed in. The sermon including the reference to Hitler was advise tendered to him and he was puzzled by the excitement it has caused. According to him, the Buddha has advised the Sangha to preach only to the wise. Now that, dear reader, is Vintage Gotabaya Rajapaksa doing what he knows best- Bana Talking– his specialty. A more learned label would be fetishization of Buddhism. The Presidential aspirant is missing the mark. The ‘Maha Sangha’ as they like to be identified are considered to be the voice of public reason. ‘Pararthacharya’- altruistic service to society was once the purpose of those who took refuge in the Sangha order. It seems that they have now given ‘Parathachariya’ a new meaning and a new task. That of appropriating our history and retelling it to suit the politics of the Rajapaksa family. Behind their claim to be the custodians of the faith and heritage is the dark desire for self-aggrandizement – an objective pursued with a narcistic intransigence. Hitler represents the essence of unprecedented evil. ‘Hitler’ invented the mechanics of tyrannical rule that obliterated all traditional elements of political and spiritual values known to mankind. The advice to be like Hitler is therefore a matter on which even ‘Devadatta’ would have second thoughts. The reference therefore is a disturbingly unprecedented precedent. For the record, I must state that I am Buddhist by being born in to a Buddhist family. I am an imperfect Buddhist who expects the Sangha to be more perfect than me in the business of ‘renunciation’- the purpose for which Prince Siddhartha left his palace. Therefore, I will not be uncharitable and myopic to dismiss his reference to Hitler and Military rule as a spontaneous or involuntary observation in a post prandial homily delivered by a flatterer and a flunkey. The personage involved is the second in command of an ancient monastic order that controls a vast network of wealthy temples holding vast tracts of land. The prelate in question is an archetypical representative of the upper-class Siam sect hierarchy. He represents a socio-political alliance and a process that perceives a Gotabaya Rajapaksa presidency as one that offers continuity, stability and progress in that order. Poet Auden’s ‘Secret is out ‘springs to mind. Hitler was a charismatic leader who personified unprecedented evil in human history. His absolute hold on Germans was a product of the terrible times that Germany experienced during its transition from Hohenzollern rule to the dysfunctional democracy under the Weimar republic. The parallels are too close for comfort. We must tread cautiously in contextualising the remarks of the venerable Anunayake thero of the Asgirriya chapter who seems clearly disenchanted with current chaos and drift under the tottering ‘yahapalanayaya’ rule. It is therefore necessary that we strive as best as we could to comprehend the rhythm of the thought behind this single cry for a Sinhala Buddhist Hitler. All actions are political, and all social relations are about power. We overlook this Gramscian premise at our peril. To do so is to lose our way. It is hoped that by placing the terms ‘Hitler’ and ‘Military’ in context, we may yet preserve what is left of our dysfunctional democracy. It will also equip us to treat the aspirations and ideals of the most venerable prelate with the seriousness and due diligence we owe him. He is no ordinary monk. He represents a powerful semi feudal monastic landlordism. He represents ‘tradition’. This notion of tradition has its inbuilt dynamics. The claims made by the Sangha fraternity as custodians of the faith and upholders of tradition have an authenticity and a moral appeal of their own. They – the Sangha enjoy the prerogative of defining and shaping their own culture and conduct. Competitive politics has made the Sinhala adjectives ‘Poojaniya ‘and the ‘Vandaneya’ [used often by our President] when referring to them, an acknowledgement of their omniscience on matters spiritual and temporal. Their remit seems to cover all subjects ranging from metaphysics and philosophy to constitutional law and urban planning. All societies are engaged in constant conflict with the modern struggling to replace the old traditional ways. Yet the political class for its convenience wants to have it both ways. The Sirisena -Wickremesinghe duumvirate is in a losing battle to be more Sinhala Buddhist than the Rajapaksa tribe. Sometime ago, the Prime minister and the Minster of Education who are now the leader and general secretary of the UNP disbursed Rs. 46million from the Central Cultural Fund to 150 selected Buddhist temples. That was pure patrimonial politics intended to boost the piety image of the ruling party. What goes around comes around. The two monastic establishments of Malwatte and Asgiriya in particular and the Sangha order in general for their comfort and convenience insist that modernity is a false god. They are great trapeze artists leaping from modernity to tradition and vice versa with supreme skill and flair. Shackled to myth and legend, their flock are lost in the land that is the foreordained repository of the faith. We are furiously engaged in mapping the contemporary world unable to fathom the depth of the abyss that separates the ‘traditional’ and the ‘modern’. Coming back to the Hitler incident, essentially and significantly, we must bear in mind that the occasion was the 69th birthday of Gotabaya Rajapaksa. He is a devoted Buddhist. He is an avowed vegetarian. He rears sharks as a hobby. He may well be our next executive president. The Asgiriya Anunayake thero used the distinctive words ‘Hitler’ and ‘Military Rule’. It is no coincidence that his call for a ‘Buddhist Hitler’ was made in the same week that a robed ruffian was punished for decidedly uncouth behavior in court. There is more than meets the eye. Contained in this episode is another story. It begins on 19th May 2009. The great unifier of the land Mahinda Rajapaksa began building the post-civil war patriotic triumphalist state. There were no longer minorities in the land. Only patriots and traitors. It was not stated explicitly. Yet, it was driven home implicitly. The Sinhala Buddhist state has finally gained mastery over all unnational deviants. It had no place or patience for outsiders, misfits and oddballs. Mahinda Rajapaksa was awarded the title “Viśvakīrti Srī Trisinhalalādhīśvara” by the Malvatta and Asgiriya chapters for uniting the island. By the grace of the two monastic authorities of Kandy, Mahinda was the titular overlord of the three regions Ruhunu, Pihiti and Maya rata. The Sangha establishment made the Mahinda Rajapaksa presidency in to a quasi-monarchy. The 18th amendment that removed term limits of the presidency received the enthusiastic endorsement of the vast majority in the Sangha establishment with perhaps the solitary exception of venerable Maduluwawe sobitha thero. There were times when the Buddhist monk was an intermediary between the monarch and the subjects. Throughout history, our Sangha have displayed a pliant disposition to seduction by autocratic rulers. Their attachment to spiritual and moral values have always remained proportionate to their institutional primacy and personal interests. Mahinda Rajapaksa gave the Buddhist Sangha far more than mere constitutional prominence accorded to Buddhism. He made them enforcers of a sovereign faith. They were granted corresponding privileges and access to materiel benefits. He harnessed the entrepreneurial talent of the urban Buddhist monk who had captured the imagination of an indolent middle class with choreographed rituals and devotional extravaganzas. He assembled a support base of an elite core of the Sangha. It remains committed to restore his rule. They need no persuasion to vouch for his devotion and piety. Now, we must contextualize ‘Hitler’ and ‘Military’ in what Antonio Gramsci the Italian cultural Marxist called ‘perpetual social ferment’ no pun intended. This is the perpetual ferment of the docile and ignorant mass that is irretrievably and naturally inclined to the so-called “idiocy of rural life” in the words of Karl Marx! We must locate the Anunayaka thero’s reference to ‘Hitler’ and ‘Military rule’ in the context of a definite and defined relationship between religiosity and prejudice. The claim that the ‘Mahasangha’ have guided the governance of the land from primordial times according to Buddhist ethical dictates is thin, delicate and does not pass the test of practical reason. 194 monarchs have ruled this ‘Dharmadeepa’. Of them 175 were Sinhala kings and 19 were Tamils. 60 monarchs ascended the throne by killing the heir apparent or ‘yuwaraja’. 53 claimed the crown by fratricide – killing the brother. 5 kings claimed the realm by patricide – killing the father. The solitary Queen Anula ascended the throne by mariticide. Sorry. We cannot oblige the venerable Anunayake thero by standing between essential truth and unchangeable practices of an antiquated past. The Anunayake thero’s homily and the arrogant dismissal of its implications by the recipient of the Hitlerite advise has a narrative of its own. Both attempt to silence the past and to erase memory. Time has arrived for us to reappraise the old cultural consensus. Those who evoke ‘Hitler’ are moral cowards who loudly proclaim how society should be run and how people should live. They fear change. They fight to restore the old order, the patrimonial garrison state. That is the precise context in which Hitler was invoked. Both, preacher and perceiver claim and actively canvass for the opportunity to shape our future. It is our business to stop this Hitlerian cooperate of Saffron and Khaki. What a brilliant essay and landmark piece of cultural criticism! Bravo, Sarath. Please send this to all the major newspapers. I thought you were in Russia! Rajash – Any idea who gave him a farewell speech! I guess it was the proletarian leader, “the younger star, a pure Jacobin orator, Wimal Weerawansa”. Interesting to see how anti-Buddhist forces support and praise each other when Buddhism and Buddhists are attacked by these followers of Non-church of England and the coloniser Roman apology for Christianity. DJ what did you have last night vodka,kallu(toddy-NABA/EPRLF Brand)or Kassipu? What ever it was keep drinking that stuff,you are sane when you do that. Sarath De Alwis: do you know that Late bhikku Nauyane Aridhamma had Stated that he believed that he was the King KOSala in a previous life, and that King is said to be preparing to become Samma Sambuddha in a future life. The Veddah and the Tamils had been the first inhabitants and the original people of this island. Although some historians accept this fact, the present Sinhala historians do not take it. Back in the old days, when H.C. Ray was the professor of history at the University of Ceylon, he used to refute the claim that Tamils were interlopers. The interlopers were the Sinhalas and not the Tamils, he used to say. However, one is unable to resonate this fact anymore. The tyranny of the ‘majority’ is dominating the post-colonial political discourses and the case of ‘Sri Lanka. The ancient kings who ruled the island, never called themselves Aryan or Sinhalese as they were neither. They were largely of South Indian origin or local Dravidian Naga both Tamil , either Hindu or Buddhist. Sinhalese and the Sinhalese language only came into existence around the 7Th century AD. So how can Sinhalese kings exist before this period. The king who converted to Buddhism was a Tamil Naga and so was king Dutigemunu. The Mahavamasa only talks about the Sinhalese areas down south and the Buddhist Anuradahapura kingdom. Not about the Tamil north east or north west coast. These areas were ruled by Tamil kings and chiefs and some of them from time to time may have come under the overlordship of a so called nominally Sinhalese king However it was they other way around for centuries the Sinhalese were under South Indian Tamil kings. . Many of the so called Sinhalese kings themselves , were largely of South Indian origin,Pandian and some of Kalinga origin. When the Europeans arrived all three kingdoms one Tamil and two nominally Sinhalese were ruled by Tamil kings. Now the Sinhalese using their majority have taken over everything. Even in the Hindu north which was monolingual the language will soon change, due to the large scale influx of Sinhalese, deliberately planted by the government as military, civil servants and settlers. The Anunayaka of the Asgiriya Chapter Vendaruwe Upali wants Gota to be the Arya Sinhala Buddhist Hitler who can take the country and rule it militarily, when he said, “You are known as a Hitler and you should use the military and take power”. This monk’s comment as a blessing to Gota’s on his 69th Birthday was not only undemocratic but also Un-Buddhist. Gota is already a Psychopath like Hitler and the Buddhist monks supporting him will only turn him into another Hitler and the country into a Buddhist-Fascist State. Remember Dr Gota (DSc) is also a vegetarian like Hitler. Alwis says “Hitler represents the essence of unprecedented evil”. This is the nauseating version of history the so-called Church of England (by the way, it is no church, just syphilitic Henry VIII’s path to divorce and murder his many wives, that is another story) has used to brain wash our colonial lackeys who are still defending their ‘British’ heritage, values and perverted versions of history. Lets forget Rev. Upali’s comment for a moment and concentrate on Alwis’ bogus view of history that “Hitler represents the essence of unprecedented evil”. On what grounds could he be uttering this patent lie? Obviously on the highly contested historical lie of six million Jews Hitler is supposed to have exterminated. (The funny thing is that there were no six million Jews living in Europe at the time, by their own counts! they were busy colonising the world). Contesting this lie is considered illegal in Germany and most of Europe. So much for freedom of expression! Any way, compare that ‘worst’ figure of alleged six million Jews killed by Hitler with the deaths and murders caused by Churchill at the two wars and the times in between, because for people like Alwis Churchill as the epitome of goodness, whiter than the lily ‘worshiped’ by them as a great wartime leader and protector of freedom, while at the same time busily blackening Hitler’s name. At WW1, Gallipoli campaign Churchill caused the deaths of 50,000 British and half a million empire (ANZAC, Australian and NZ) soldiers through stupid management of the war as a civilian, often against the advice and opinions of military commanders. In 1943, up to ten million Bengalis were starved to death by Churchill by diverting Indian wheat to British soldiers in Greece while a deadly famine swept through Bengal. Churchill has more blood on his hands than Hitler because he personally signed off deaths of these ten million people alone. Churchill ordered the firebombing of the ancient cathedral city of Dresden from 13 to 15 February 1945, dropping 2,400 tons of high explosives and 1,500 tons of incendiary bombs targeting civilians. Up to half a million civilians were blown up or incinerated. Atomic bombings of Hiroshima and Nagasakiin August 1945, killed at least 250,000 people. Both these atrocities were committed as revenge attacks after the war was well and truly over. He was in power, unelected, elevated to the premiership on 10 May 1940 by the Rothschilds, replacing Chamberlain as British prime minister who had always opposed the use of bombing against urban civilian targets. After killings of millions of civilians, the British people ejected him at the only opportunity they got, the general election on 26 July 1945. Churchill’s boast that history would treat him kindly, since he would write it, has proved far from idle. People like Alwis are serving that purpose out of ignorance and colonial servility. Fully agree with historian. Dayan should pause and think twice before jumping headlong to the cesspool of Sarath and the like. While I am no fan of Hitler, we need to be congnizant of the immense death, destruction and suffering caused by European colonialism led by England. Of course we also know the cultural background of those who attack Sinhalese Buddhists at any given opportunity. Those attacks further strengthen Sinhalese and Buddhists resolve further to resist and fight back against current project of succumbing Sri Lanka, the mother land and it’s people to the waning Western hegemony. 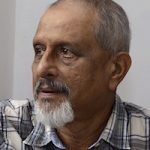 A handful are causing irreparable damage to the reputation of Lanka in general and Lankan Buddhism in particular. The handful are manipulating the ignorant. They know exactly what they are doing. Two thousand years of history and five hundred years of colonialism hardly dented Lankan Buddhism..
We, the silent majority are helpless. Congratulations on this brilliant exposure of a dangerous trend in monkish political thought. Yours is a wake up call to the sleeping Sixth Estate to rise and act to save the country from descending to totalitarianism and kakistocracy. Humanity had enough of one Hitler, who with his pseudo-Arianism gave us Gas Chambers and Holocaust. Even to invoke his memory is to play with fire in the current political climate of Sri Lanka. Will Gotha unequivocally dissociate himself from being labelled after that monster?